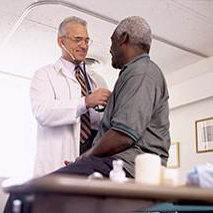 Black men diagnosed with low-risk prostate cancer may have more aggressive forms of the disease than nonblack men with the same diagnosis, according to a study published in JAMA. Thus, even black men classified as having the same Gleason-grade prostate cancer may have a greater risk for death than their white counterparts. Mahal and colleagues used the SEER and Prostate Active Surveillance/Watchful Waiting databases to analyze 192,224 men (black, n = 31,841; median age, 62 years; nonblack, n = 160,383; median age, 65 years) with localized prostate cancer. A greater proportion of black patients had clinical T1- to T2a-stage disease (81.3% vs. 75.3%; P < .001) and Gleason 7 to Gleason 10 disease (60.1% vs. 55.8%; P< .001). Median follow-up was 36 months. Overall, Gleason 6 disease was associated with a lower risk for prostate cancer death (206 of 83,645; 0.25%) compared with Gleason 7 to Gleason 10 disease (1,481 of 108,579; 0.77%; adjusted HR [aHR] = 0.25; 95% CI, 0.22-0.3). Also, risk for prostate cancer death overall was not significantly different statistically between black patients (n = 326; 1.02%) and nonblack patients (n = 1,361; 0.85% aHR = 1.1; 95% CI, 0.96-1.25). However, results showed that 51 of 12,707 (0.4%) black patients with Gleason 6 disease died compared with 155 of 70,938 (0.22%) nonblack patients with Gleason 6 disease (aHR = 1.95; 95% CI, 1.42-2.67), suggesting an increased risk for death among black patients with Gleason 6 disease. For patients with Gleason 7 to Gleason 10 disease, 275 of 19,134 (1.44%) black patients died of prostate cancer compared with 1,206 of 89,445 (1.35%) nonblack patients (aHR = 1.01; 95% CI, 0.87-1.16), showing comparable risk between the groups. Researchers found similar results in cohort of 403,022 patients (black, n = 62,736; nonblack, n = 340,286) with prostate cancer with a median follow-up of 65 months. Results in this cohort showed higher 12-year mortality rates among black vs. nonblack patients with Gleason 6 disease (2.2% vs. 1.4%), but comparable rates among those with Gleason 7 to Gleason 10 disease (5.5% vs. 5.3%; P < .001 for interaction). Limitations of this study included short follow-up periods. “These data would be an impetus for randomized, prospective trials to both better characterize Gleason 6 disease in black men and to test different management strategies,” Mahal said. Disclosures: Mahal reports research funding from the Prostate Cancer Foundation. Please see the study for all other authors’ relevant financial disclosures.